SErious SAILORS REQUIRE MORE POWER. THE NEW LRC SEries DELIVERS IT SAFELY AND RELIABLY. Historically, the average DC power draw was less than 100 amp-hours per average day of usage. Currently, with the plethora of navigational electronics and convenience appliances that make cruising safer and more pleasurable, that figure has doubled to 200 amp-hours. Today’s sailor needs a more sophisticated system to handle these additional loads. For increased performance in a marine electrical system, adding additional batteries is not a solution. 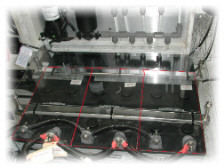 A marine system is not as simple as what we are most familiar with, an automotive system. If it were, then it would be simple to hook up an automotive alternator to a large bank of automobile batteries and you could leave the dock with all the power you wish. But for heavy duty marine purposes, there needs to be a different solution. A system that gives you all the power you need, and more importantly provides that power safely and reliably. 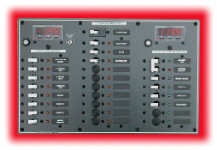 A system that employs the latest in marine electronics technology. A more sophisticated, intelligent one--The Caliber Smart Electrical System™. At the core, large deep cycle batteries are installed as standard equipment. They are important because of the energy they are capable of storing. 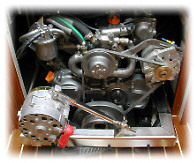 The SEries models come with a pair of high acceptance deep-cycle 200 amp AGM (Absorbed Glass Mat) marine batteries (three in the 47LRC SEries model). These are large batteries which are carefully located for great accessibility. Even more convenient, adding an optional battery is a breeze. But these powerhouses require specialized charging and monitors to be able to supply their power safely. Next, an important step, is the removal of the standard automobile alternator that comes with most engines, marine included, and replacing it with a high-output, small frame alternator. This alternator is capable of producing 110 amps of charging power. Yet this high output alternator is simply not enough to insure the batteries get topped off properly. Monitoring is also essential. To take advantage of the increased alternator power it’s important to make the high output alternator work efficiently and safely with the deep-cycle batteries. Therefore, in the Smart Electrical System™, there is a specialized "smart regulator." This regulator can be considered the communicator between the batteries and the alternator. It controls the charging power to the batteries in a sophisticated step sequence regulated not only by the voltage, but temperature too. Criteria which are monitored for the optimal charging sequence. Should there be a malfunction in the system, it would be indicated by an error lamp and associated audio buzzer which is included as standard. It’s a valuable safety feature on a yacht that depends upon reliable battery power. Battery charging while the engine is running is fully automatic and does not require any manual intervention by the captain. If the captain wants to know the status of the charging regime at any time, a status lamp is incorporated in the smart regulator for this purpose. Another important built-in safety feature is that the independent starting battery is isolated from the house batteries. No switching has to be done after starting the engine to charge all batteries. But in the event that the starter battery fails, there is an emergency parallel switch in the system that makes it simple to transfer the power from the house batteries to start the engine. The Caliber Smart Electrical System™ is designed to be not only safe today, but in the future too. The entire electrical circuit of the yacht is protected with a circuit protection device (CPD). Every circuit has to go through this main CPD. To help insure this remains so for additional equipment, there are additional positive and negative distribution posts. These posts are convenient attachment points for future electronics. For further safety, a manual emergency cut-off switch is installed that is capable of shutting down the entire DC house battery system quickly. With the introduction of the Caliber Smart Electrical System™, Caliber continues to lead the way with well-engineered safety features. Emergency parallel switch for house battery use as back up engine starting battery. Dual alternator power option for additional 200 amp charging power.